The changing literary and book publishing landscape makes it difficult for new authors to breakout. A plethora of new distribution formats, especially focused on self-publishing, opens brand new avenues for writers to get noticed, but also makes it incredibly easy to get lost in the sea of content. Unless you have a pre-existing social platform or public profile that extends beyond the world of books, “discoverability” can be a very elusive thing and it can be nearly impossible to get noticed on social media. Are you Twitter or Instagram? Are you Snapchat or Pinterest? When first starting out, it can be tempting to sign up for every platform under the sun. And while it’s a good idea to at least reserve your handle (preventing someone else from taking it), you probably shouldn’t start posting away everywhere. What platform do you like and feels most instinctual to you? Do you want to share pithy quotes? Then choose Twitter. Are you out of storage space because of all the photos you’ve taken on your phone? Then choose Instagram. Do you have pages and pages of inspiration for your characters? Then put it all on Pinterest and invite your readers to find extra content there. This may seem intuitive, but it’s important. You want followers to easily find you. And, unfortunately, this can be more difficult than it seems as well, because some handles may already be taken. So, chose one where you can be consistent. It can be tempting to link all of your accounts together and post one thing at one time, but try to resist that temptation. Each social media platform has its own community and set of rules. For one thing, if people follow you on multiple platforms, they’re going to know that you’re just being lazy. And that concern aside, often certain things won’t translate across platforms (tagging, for example, is hard to do when platforms are linked). But most importantly, each platform should have its own voice, which should be developed and honed. Your content should reflect who you are as a writer. Share ideas and insights that distinguish you from other authors and public figures. Always remember who you’re talking to – your audience and who they consist of – and think about your “brand” (see number 6 for more on branding). Post consistently and often. At this point, most platforms reward you for activity, i.e., there are algorithms that will naturally boost more popular posts, but consistency helps as well. It will also encourage people to follow and engage with you. Social media is a chance to get to know and really engage with your readers. If they like your writing, they’ll want to know when your book is coming out… but they want to engage in different ways too. No one likes being asked to buy something every time they see you. Don’t forget to go back and comment on comments. This is the whole benefit of social media! You can talk to your followers in real time and build a relationship with them. Authors can be a hugely supportive community. Just as you would reach out to other authors for blurbs, reach out and engage on social media as well. Hashtags help drive engagement and help grow your fan base. Tagging helps lead people back to your page that may not have otherwise seen it. It’ seasy to forget that you’re becoming a public figure if you’ve spent most of your life being private. But now simple posts are subject to scrutiny, so just watch your intention and tone. You don’t want something taken out of context, or to turn people off from your writing. All publicity is definitely NOT good publicity. 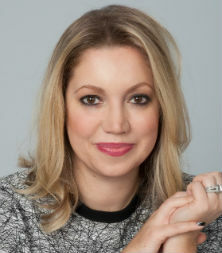 Emily Sweet is the Executive Director of Brand Development and Client Initiatives at Park Literary & Media. Among other things, she advises PLM clients on how to find their voice on social media, create an online presence, and develop a consistent brand strategy. She’s a former lawyer who now works with Nicholas Sparks, Emily Giffin, Debbie Macomber, Janice Y.K. Lee, Taylor Jenkins Reid, and many others. For more information on Park Literary & Media, as well as the authors they represent, visit parkliterary.com or find them @parkliterarymedia on Instagram and @parkliterary on Twitter. Love these tips! I agree with all of them. It can take some time to find your voice on social media but the more you use it, the easier it becomes. I’ve also noticed that my linked posts don’t generate much buzz so I’ve been thinking of scrapping those. You just helped confirm that decision. This is an excellent post about writers using social media. For many writers, social media remains a mystery. They use a platform but they don’t sell books. K. D. Dowdall shares tips on using social media effectively. Great knowledge shared. I believe we need to network with other writers, artist and musicians. Allow us to grow and reach-out to more people. Hi Sylvia, Thank you and very much appreciated. K. D.
Please read my blog related to consistency on http://fireinyoursoul.com/2017/02/24/shine-bright-like-the-sun/ Please follow for more .